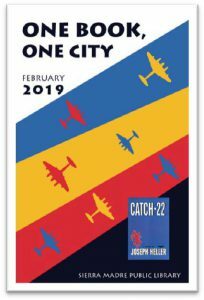 Press Release posted 1/27/19 – You are invited to read, react, and revel in Joseph Heller’s triumphant novel, where the main character’s true mission during WWII, was to simply get out alive. Follow the unkillable anti-hero, Yossarian through a fulfilling array of events. A Look at Joseph Heller and his Work by Rich Procter (accompanied by singing group Remember When). Saturday, Feb. 2 at 1:00 pm at the Library. Off the Page Full Reading of the Catch-22 Stage Adaptation, directed by new Playhouse Associate Artistic Director C. Julian White. Monday, Feb. 4 at 7:00 pm at the Sierra Madre Playhouse. HBO Documentary World Premier of The Cold Blue with producer Peter Hankoff. Saturday, Feb. 16 at 1:00 pm at City Hall. Documentary Double Feature with The Memphis Belle: a Story of a Flying Fortress (1944). Saturday, Feb. 16 at 3:00 pm at City Hall. Third Thursday Book Club. Thursday, Feb. 21 at 11:00 am at the Library. American Military Museum Tour. 1918 Rosemead Blvd., South El Monte, CA 91733, (626) 442-1776. Adults- $5, Veterans/Seniors (65+)- $4, Juniors (10-16)- $3, Children (5-9)- $1, Children Under 5- Free. Saturday, Feb. 23 at 11:00 am. 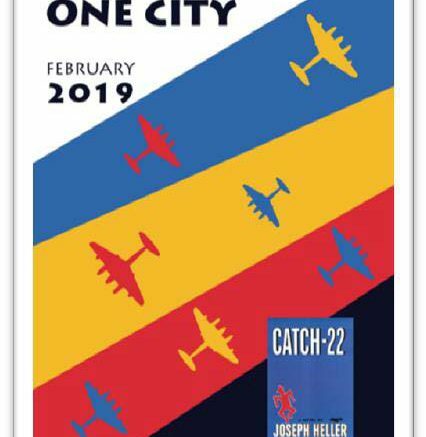 Yossarian “knew everything there was to know about literature, except how to enjoy it.” Join our community of readers during One Book One City, and we’ll make sure you enjoy yourself. Pick up a full outline of events at the Library or call 626-355-7186 for more information.